The Bank of Fergus County (originally built in 1883) at 223 W. Main (Megahertz) was rebuilt in 1904 after a disastrous fire damaged it when the Lewistown Hotel next door burned to the ground January 16, 1904. “The Bank of Fergus County Lewistown Montana will receive sealed proposals up to noon of May 26, 1904 for the erection and completion, exclusive of plumbing and heating, of a stone and pressed brick two-story and basement office building…” (Fergus County Argus, May 18, 1904). 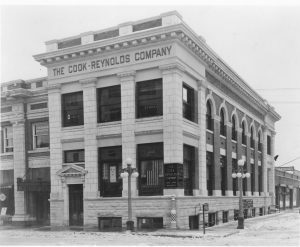 “The contract for the building of the new home of the Bank of Fergus County was let this week to the Congress Construction Company of Chicago……. Architect J. H. Kent drew the plans for the new building …It is to be located on the corner of Main Street and Third Avenue and it will be 33 x 100 feet in size. It is to be completed by December 1….in the basement of the building will be a barbershop, cigar store and the public library. Near the south corner of the building will be the entrance leading to the stairs up to the second story.” (Fergus County Argus, June 8, 1904). “Excavation for the Bank of Fergus County building is now in progress and work on the new structure will be pushed with all possible celerity. H. B. Farnham has six teams on the job.” (Fergus County Argus June 15, 1904). “George Riley, of Chicago, will do the fancy stone cutting for the Bank of Fergus County building.” (Fergus County Argus, July 6, 1904). “The new building for the Bank of Fergus County is a two-story structure of cut stone and pressed brick. A large vault has been put in on the main floor and a safety deposit vault for the use of the customers of the bank. Another vault occupies a portion of the basement and this will be used for storing old papers and records of the bank. The remaining portion of the basement will be fitted up for use as a barbershop and will be occupied by Albert Johnson.” (Fergus County Argus, December 28, 1904). 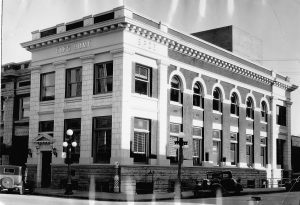 “The Bank of Fergus County opened for business in its new and handsome building at the corner of Main Street and 3rd Ave., Monday morning. The vestibule is wainscoted with Georgia Verdi antique marble and the entrance into the banking room is through heavy doors, fitted with plate glass. The counting room is finished throughout in mahogany. In front and facing on the street are the rooms of the president and officers. …vaults which are fitted with massive doors, constructed by the National Safe Lock Company of Cleveland, Ohio. In the vaults are the safes, together with the safety deposit boxes for subscribers. This floor is provided with a fine lavatory. In the rear basement is another large vault, where the bank records are kept and a large room where it is intended that patrons from the outside may have desks if they so desire. The upper floor is divided into eight offices, all finished in tamarack. One novelty seen in the banking room is the interlocking rubber tile floor which takes the place of the usual stone tiling. It is made of rubber and is almost noiseless and is now largely used in the big transatlantic steamers.” (Fergus County Argus, January 18, 1905). In 1915, the building was remodeled with an entire new front of brick and replaced with terra-cotta. 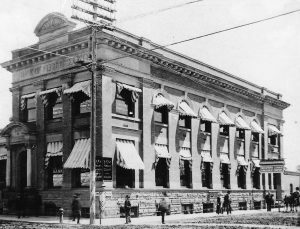 Later, in 1916-1917 the bank moved to its newly constructed building at 224 W. Main (The Montana Building). 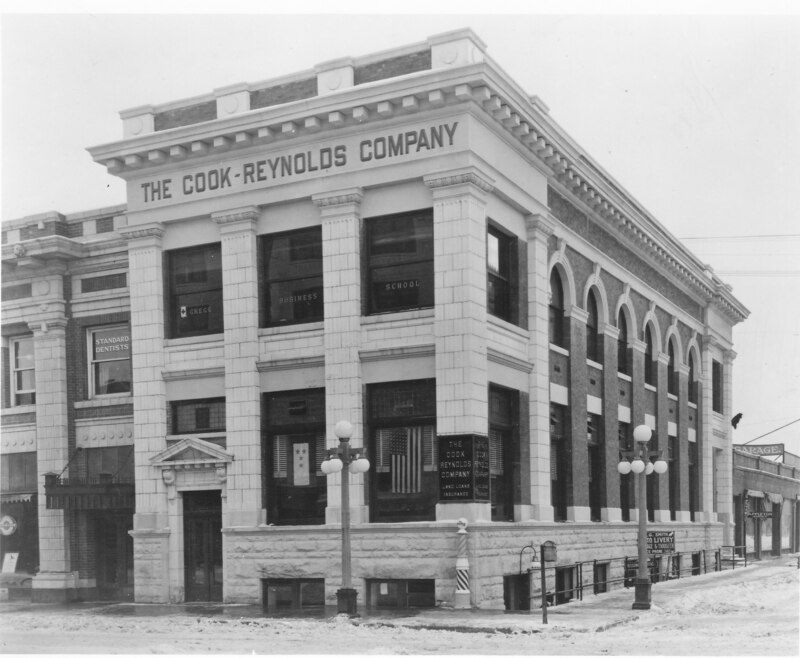 Then the Cook-Reynolds Company leased the building and placed their name on the top of the building. In 1936, the building was sold to the Elks and their name was placed on the top of the building. Historical Note: In the first Bank of Fergus County that was built in 1883, Charlie Russell did a painting on the vault door and another painting above the vault door. (See the 1901 Fergus County Argus Pictorial Edition).